This weekend, we celebrated Neva’s first birthday! Can you believe it? She’s now one year old. Such a big girl compared to that silly little puppy pup she once was. Neva has learned so much since we brought her into our home. She still has a lot more to learn, but we’re so proud of how far she’s come. Neva has had a lot of time on snow in the ten months we’ve had her, and every single time she acts like it is the very best thing ever. How could I not love this girl? I guess this is why I love dogs in general – they have this undying genuine enthusiasm for living. 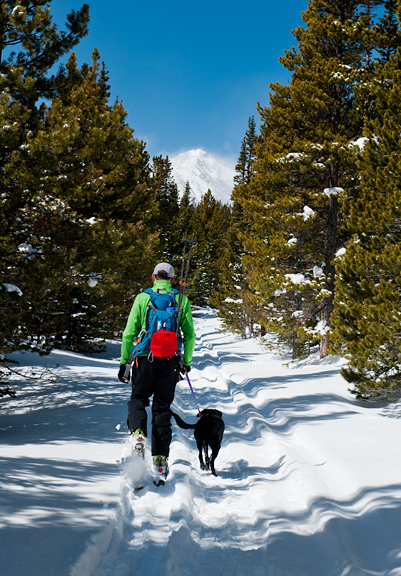 Jeremy and I decided that we’d take Neva on a nice backcountry ski for her special day. 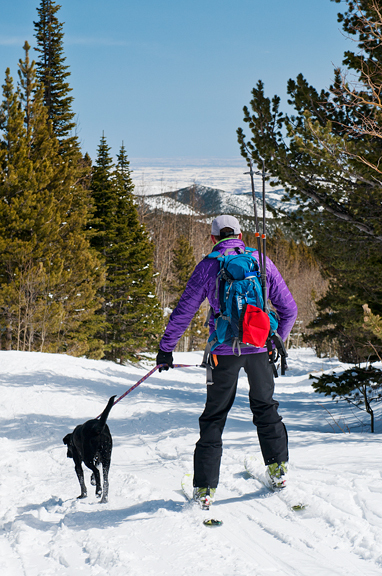 She got lots of snacks on the way up and tons of running on the way down. After all of that exercise, we made sure Neva replenished those calories lost and then some. She partook of some raw beef (her favorite) and sampled a couple of strawberries (she likes those) and she had cake. Yes! She had birthday cake! 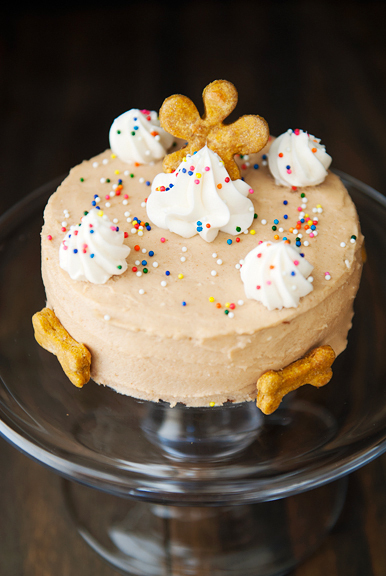 I had done some quick research a few days earlier to make a nice dog-friendly cake for our puppity pup. 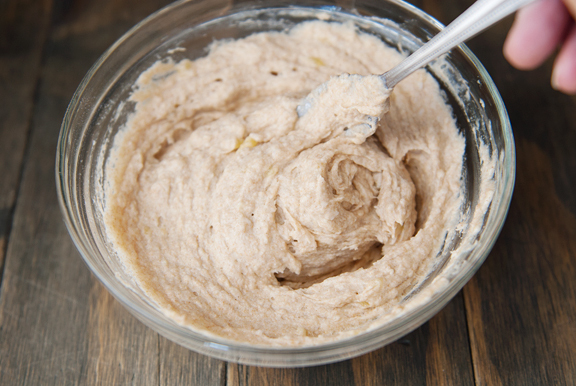 It is mildly sweet (from applesauce and banana) and tastes like a bland, fluffy quick bread to us humans, but Neva LOVES it! Of course, Neva is a lab, so she loves pretty much anything. The recipe is simple and quick. The best part is that it is pretty well-behaved even at my elevation. Winner. I tried to avoid any added sugars – even honey – because I don’t think Neva needs sugar (she’s spastic enough as it is). 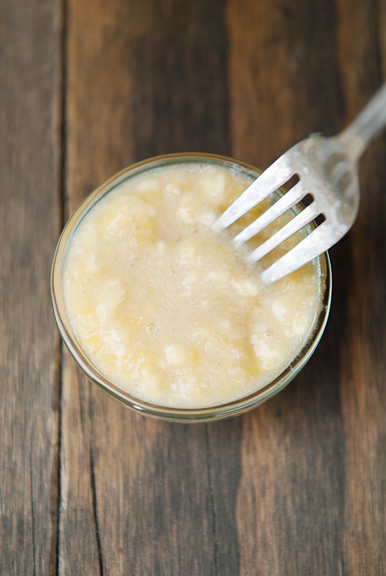 The banana and unsweetened applesauce add just a touch of sweetness. The riper the banana the sweeter it will be and the easier it is to mash it up. [Edit: I know you guys won’t go crazy with the coconut oil, but just as a guideline – don’t give your dog more than 1 teaspoon of coconut oil per 10 pounds of dog weight per day. That means Neva isn’t allowed to eat the entire cake in a single day.] I melted the coconut oil so it would be easier to stir into the batter. Just make sure it isn’t piping hot or else it might curdle the egg. 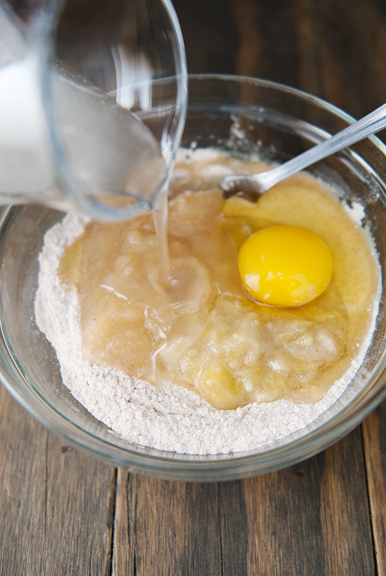 The batter will be rather thick and more like a quick bread batter than a typical cake batter. I decided to make two 4-inch round cakes and had enough batter left over to make two cupcakes. 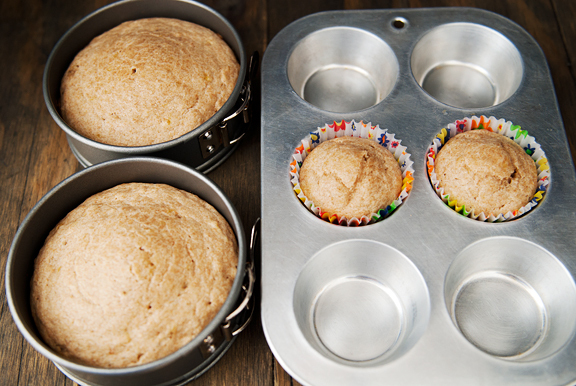 In general, fill the cupcake liners or cake pans no more than half full. Frosting is optional. I mean, these are dogs we’re talking about. They will not be slighted if you don’t frost their cakes and cupcakes. But we’re also talking about me baking a cake for Neva’s first birthday, so you know I’m going to frost that sucker. I opted for a mix of cream cheese and peanut butter. And because I was shopping for cream cheese on the Friday before Easter, it seems that everyone was out of block cream cheese, so I had to buy whipped cream cheese. Either way, they blend together to form a decent frosting. Adding powdered sugar and some butter would give the frosting better spreadability, but I wanted to keep it simple as well as minimize any puke episodes. The cakes baked up beautifully. I am always a little nervous when trying out a cake recipe because things can get wonky at my elevation, so this is good news. Both the cakes and the cupcakes domed a little, but the cupcakes got frosted on top and the cakes were trimmed and then frosted. Even completely cooled, the cakes were quite moist, but still very easy to slice into two even layers. I saved the tops for later because Neva can snack on those. Actually, Jeremy and I tasted part of a top and it was not bad. It wasn’t great by our standards, but it wasn’t bad at all. I couldn’t help myself and added a few sprinkles to the cupcakes and cake. They are so festive looking with sprinkles! We let Neva sample a cupcake the day before her birthday, just for quality assurance. I mean, I couldn’t serve her a birthday cake she hated, right? There was no hating whatsoever. For the longest time, we couldn’t get Neva to sit in front of the cake because she runs away from the things she really wants. Dog logic. 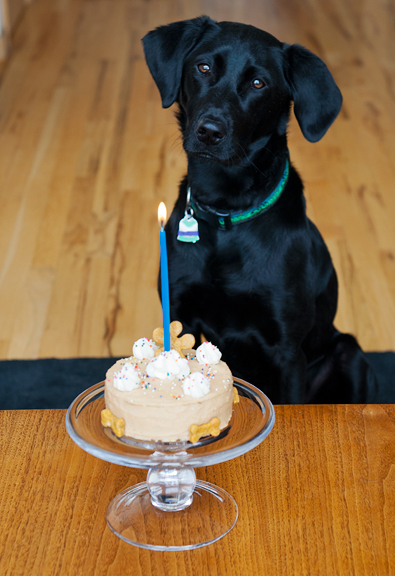 Eventually, we had to let her sit a few feet away from the cake and then move the table up to her while emphasizing the “stay” command. Hey, at least she didn’t lunge at it. 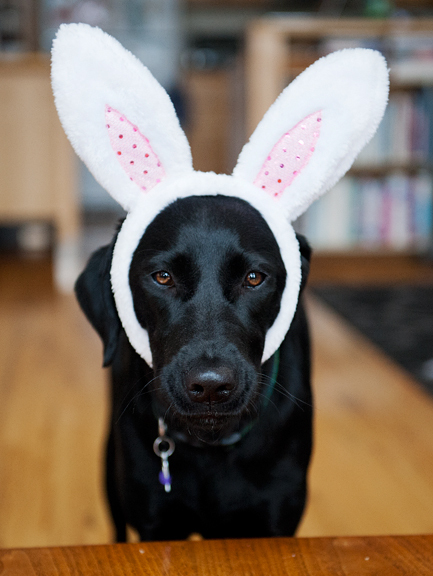 Of course, I couldn’t help picking up these rabbit ears for Neva. 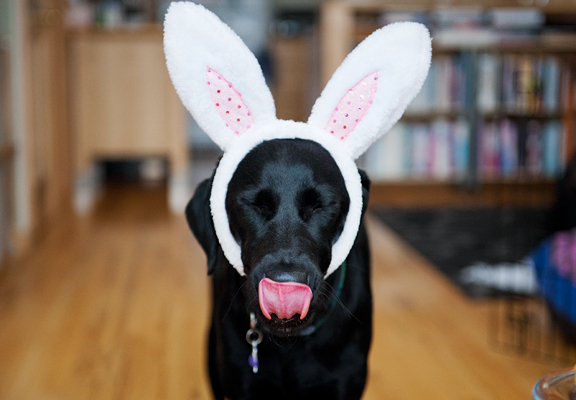 We don’t celebrate Easter, but since her birthday was on Easter and because she LOVES rabbits… It took a lot of persistence on our part because she kept trying to eat the ears. 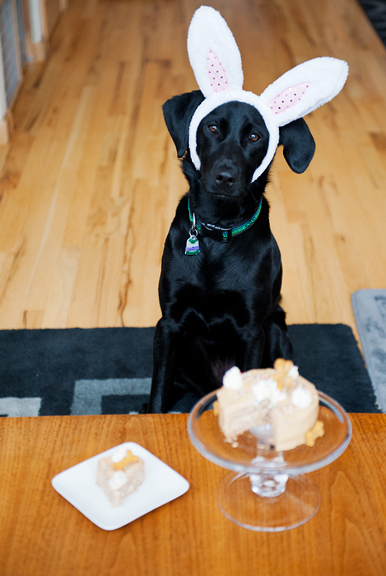 But once we set the cake in front of her, she completely forgot about the ears. Happy birthday, baby puppy Neva! 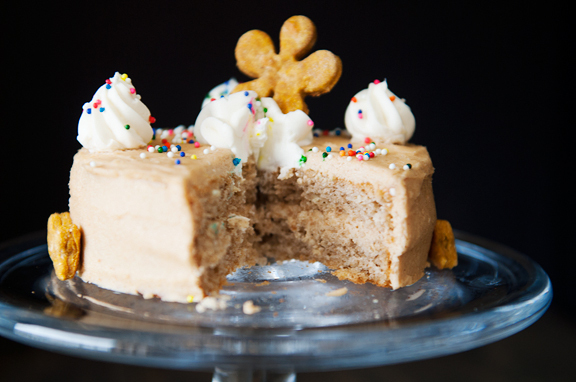 * A reader pointed out that a handful of peanut butters contain xylitol, which is a sugar substitute and can be toxic for dogs. 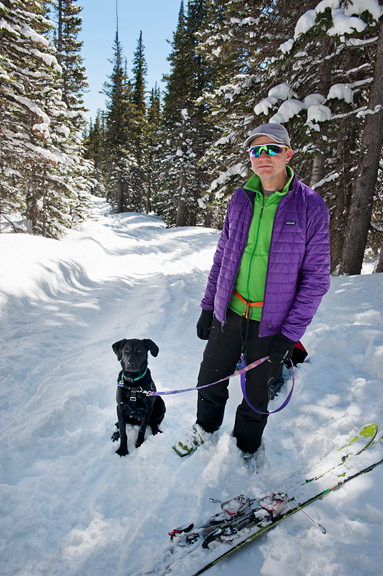 Please make sure that the peanut butter you feed your pup is safe! Bake the cake: Preheat oven to 350°F. 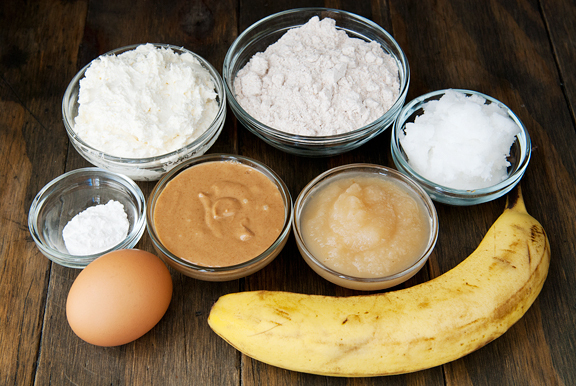 In a medium bowl, mix all of the ingredients together until the batter is thick and uniform. 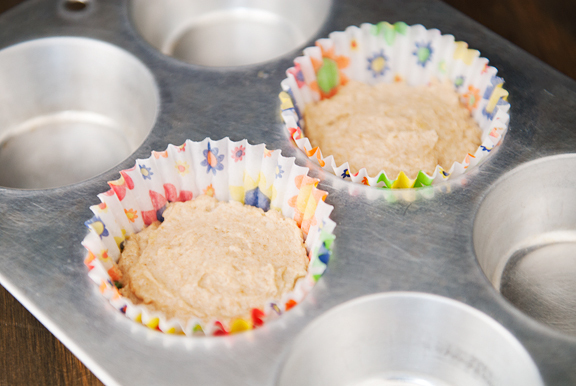 Fill 6-8 cupcake tins lined with cupcake papers half full with batter. Or you can make two 4-inch round cakes (filled halfway) and two cupcakes. Or you can make two 6-inch round cakes. 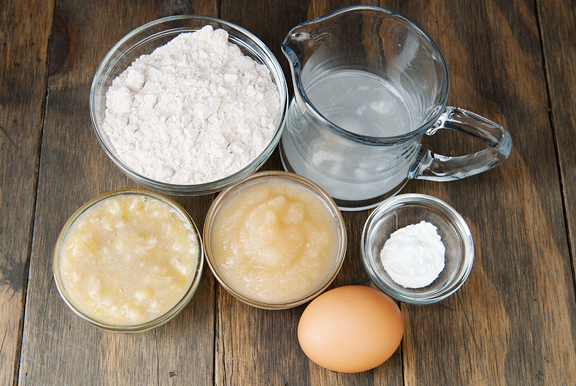 If the cake pans are not non-stick, then grease and flour as needed. 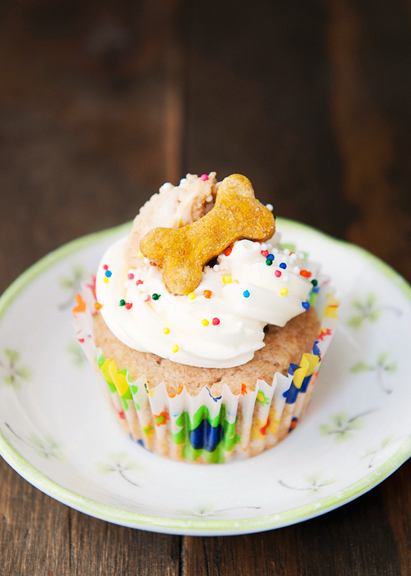 Bake the cupcakes for 10-12 minutes until a toothpick inserted in the center comes out clean. 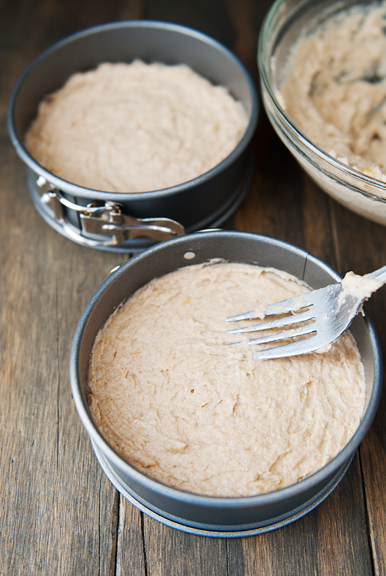 Bake 4-inch round cakes for 14 minutes. 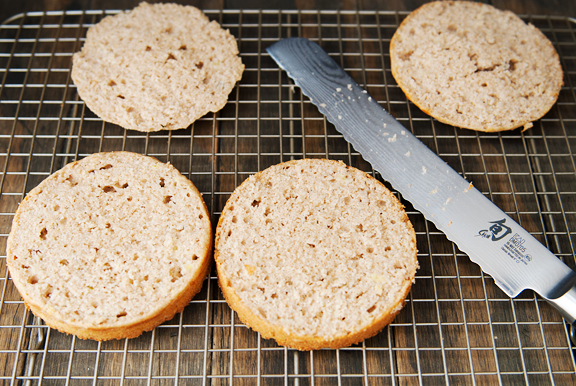 Bake 6-inch round cakes for 15-16 minutes. Both round cakes are ready when a toothpick inserted in the center comes out clean. Remove from oven and cool. 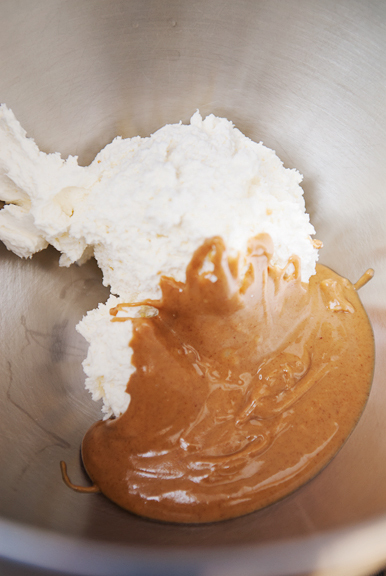 Make the frosting: Beat the cream cheese and peanut butter together until smooth. 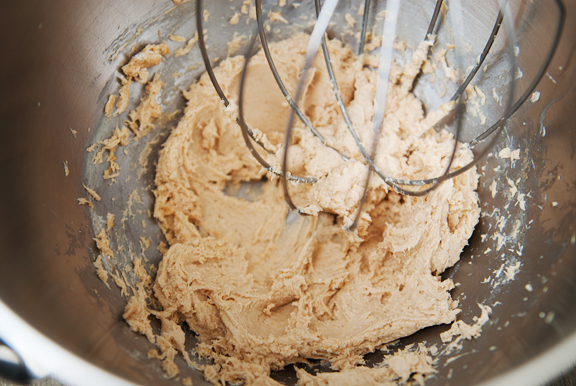 If the frosting is too stiff, add more peanut butter to achieve desired consistency. Frost the cupcakes or cake(s). Makes 6-8 cupcakes, or one 4-inch double layer cake and 2 cupcakes, or one 6-inch double layer cake. The cake should keep for 3-4 days covered in the refrigerator. She really is a beautiful girl and one very lucky pup. Thanks for sharing these photos – I love them!! Happy birthday, Neva! 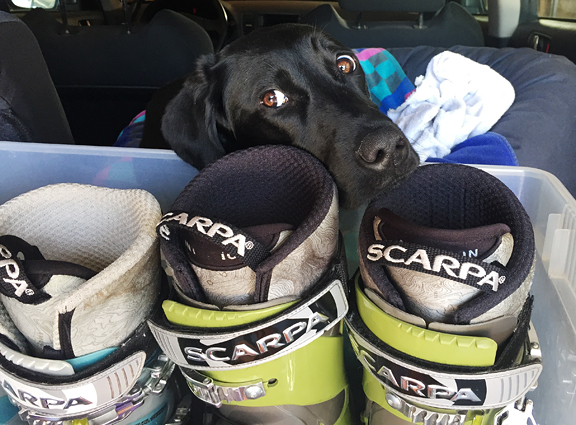 She had such big pupshoes to fill but looks like she has fit in perfectly with your life. What a special girl. Happy day to all of you! you guys kill me. K.I.L.L. M.E. with the hilarious. and the cute. and the puppy love. PERFECTION! Happy birthday Neva 🎂🎂🎉🎉 ! I have been looking forward to this post, thinking about what you would make for her birthday feast. What fun. Thank you for sharing. Oh my!!! Time does fly… what a lovely girl! It goes so fast..
Oh my. I was having a lousy day but this post literally made me laugh out loud. A BIG happy birthday to Neva. What a lucky, lucky pup she is. And what a lucky reader I am. 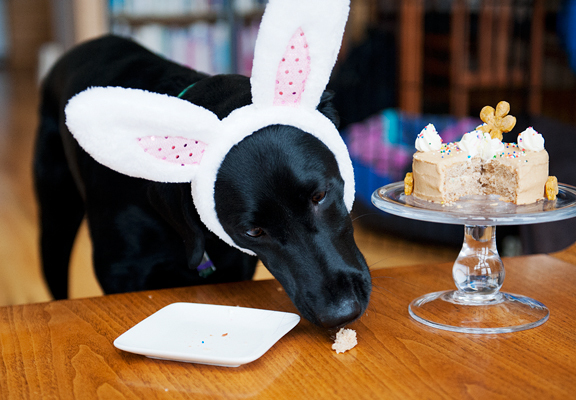 The cutest thing I EVER saw is that pup sitting in front of that cake….I liked the one without the ears best. She just melts your heart! Seeing how your Hubby loves her is just too precious and also melts the heart. Happy family indeed! Happy Birthday Neva!! You are beautiful and your parents are completely wonderbar!!!!! But they grow up too fast. I had a good laugh, loving the rabbit ear photos! Has it been one year already, time flies when you’re having fun! Happy birthday Neva! 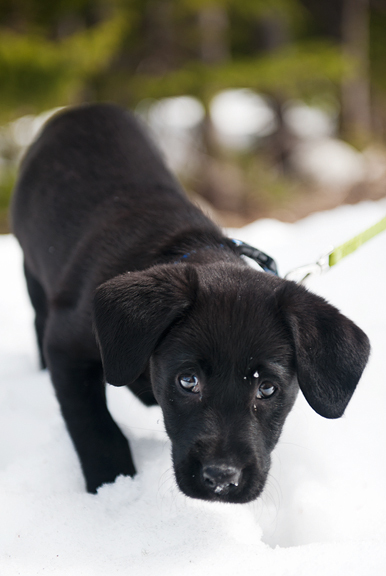 You are one cute and lucky pup! The last photo made me laugh. And rabbit ears on dear Neva. If you show her those pictures when she’s a teenager she’s gonna freak. Awww Mom! Making this for Sydneys 1 year adoptiversary. 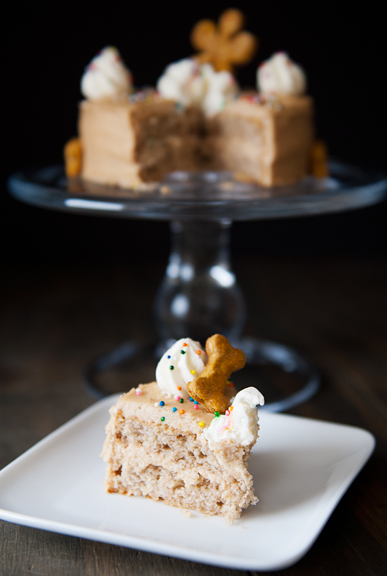 How did you make the lighter icing on top? Meghan – It’s whipped cream cheese. Hi! I noticed in the directions you mentioned putting cream cheese in the cake but the recipe at the bottom doesn’t call for cream cheese. Please let me know how much cream cheese to add! 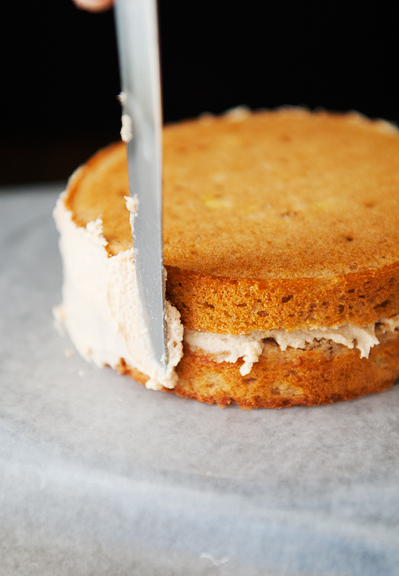 Lili – The cream cheese goes into the frosting (cream cheese and peanut butter). There isn’t any cream cheese in the cake itself.